Q:What is the licensing scheme? Our scheme is per-seat licensing. Please purchase a license key for the total number of users who will use the software. The license is for use of the current or any prior version of SyncScribe in perpetuity. Q:Does a purchased SyncScribe license expire? No, you may indefinitely use either the current or any prior versions at the time of purchase. You will need to get an upgrade license (good for 1 year) in order to use newer versions released after the purchase date. Get 1 year of free upgrades included right now with a purchase of a new license. Q:Which versions of VLC and Media Player Classic are compatible with SyncScribe? SyncScribe version 4.00 released January 2019. 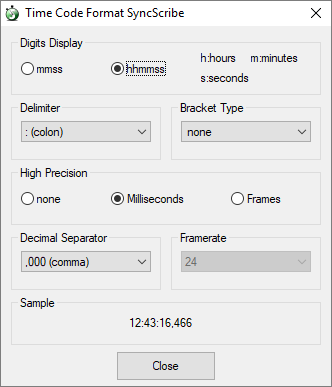 Q:Can SyncScribe correctly insert timecodes that are imbedded (burnt-in, BITC)? Yes, use the "Time Code Synchronization" feature in SyncScribe, described in Section 14	of our reference manual. Using this feature, SyncScribe simply adds or subtracts the difference between the desired timecode and the actual playtime. Q:I can't get VLC or Media Player Classic (MPC) working with SyncScribe. What is wrong? Ensure the correct media player is selected in SyncScribe under Settings->Media Player. For VLC, make sure the Web Interface password is setup correctly. Check the ports used by either VLC(8080) or MPC(13579) are allowed by you computer's Firewall and UAC settings. If you use a managed computer, contact your system admin. Please try our reference manual instructions. Section 16 for VLC and Section 17 for MPC. Q:Can I paste time codes in a different format from the default "mmss"? 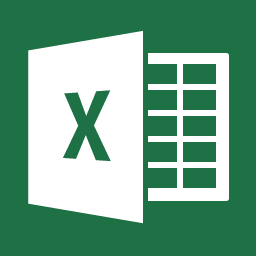 Q:Can SyncScribe paste into multiple contiguous cells in a spreadsheet like Excel ? Yes, use the checkbox option "Paste Into Cells" located in the SyncScribe "Options" section. This will cause SyncScribe to jump to the next available cell whenever there is a "tab key" in the inserted text. Section 12 of our reference manual shows where this option is located. Q:How do I enter a "tab key" into the SyncScribe "Names" section? You can insert a tab key into the Names fields by typing CTRL+TAB when editing the fields. Section 9 of our reference manual further explains the Names area. Q:Which shortcut keys are most recommended for increased productivity? According to user feedback as well as our experience, here are the recommended shortcut keys. Ctrl + Left Arrow + For jumping a few seconds back in the media file. Ctrl + Right Arrow + For jumping a few seconds forward in the media file. Ctrl + Space + For Playing/Pausing the media file. F1 ~ F4 keys , , , Insert preconfigured name and timecode. F9 and F10 keys , Insert current timecode of the media file. We can communicate in both English and Japanese. Our team will do its best to respond promptly. All fields are required. Please click "Submit Message" when finished. SyncScribe is excellent for quickly translating video or audio files into time-coded text. We are a software and IT services company. Copyright © 2019 SyncScribe All Rights Reserved.